i finally come to fully understand wat are d things u try to let me see n feel . without bitterness, ull feel no sweetness, without sadness, there wont b meaning for happiness . for the past 6 mths . it was pretty a bumpy road . mood swings, sadness, home sick .. then at d point where im just abt to give up . even calling to check n was abt to take d next flight home , suddenly a few days later . everything went 180 degress and head for a new direction . during the 5days road trip . it was a new exp for me . had lot of time to think abt things dat has happened to me n things dat are happening for me . officially i can call the city of angels my ‘home’ . during the d road trip, i couldnt bliv it but i was missing d ppl in LA . each and everyone of em . sometimes u just have to taste some salt in order for u to know how sweet is d sugar . while on d road trip, no words can express how is it like to see d ray of sunlights shooting out from the horizon by d waves , d stars in d sky so clear at d same time . with d sea breeze gushing by u . n music playing while u drive along d coast , i really can see it all so clear all of a sudden, yet im wondering how did it all fall into place? why did a door of light suddenly show up when im abt to give up everything ..
last but not least, i din expect myself hugging n growing close to someone, d worst part is missing her . 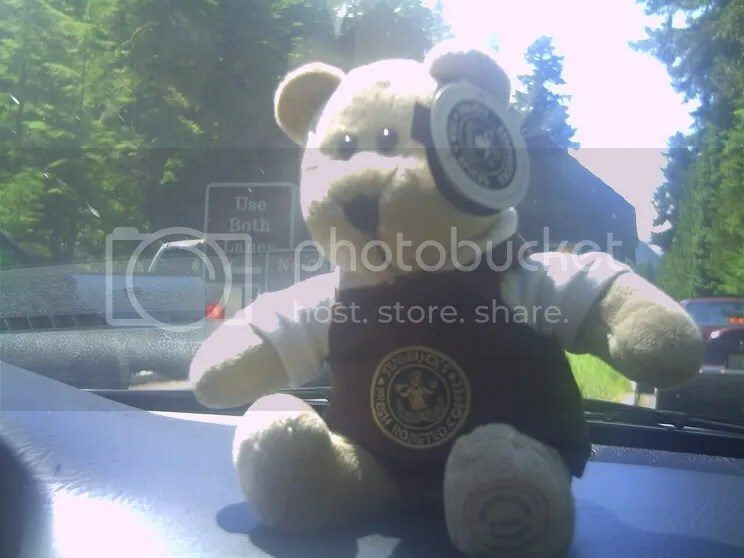 she has d other bear ..
Aww..that sounds GREAT Marv…it’s marvellous…heheI’m glad everything is coming together for you…even the new sparks of something special.I feel much better since the last time I chatted to you….am in the ” i CAN do THIS” mode at the moment. =)Wish me lucky!! YOUR SO TAN AND THE ROES 🙂 hott. Glad to see that you’re having better times now. What I can say is appreciate it as much as you can. Miss someone ar? I wonder who…. hehhehe must be someone i know….. i guess i’ll get to see her at Teisto Rave? hey.. remember.. NEVER GIVE UP! i’m glad that everything fall in place now.. but then again.. if u ever face any obstacle or depression again.. be calm and treat it as a challenge for u in life in order to success.. rite? =) things are working out for ya! live life to the fullest while you’re in LA!